Trailer road-trip report and photos | VE3NBC - North Bay Amateur Radio Club Inc.
Drew, Bruce, Keeling and Bill G. travelled to Bolton and visited Via Trailers. 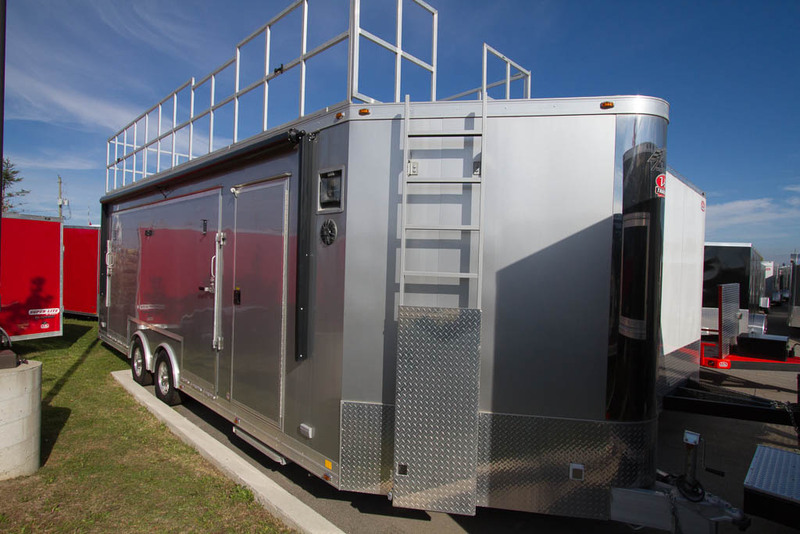 Via is a dealer for both Stealth and ATC trailers. Both of these units are made in the U.S. 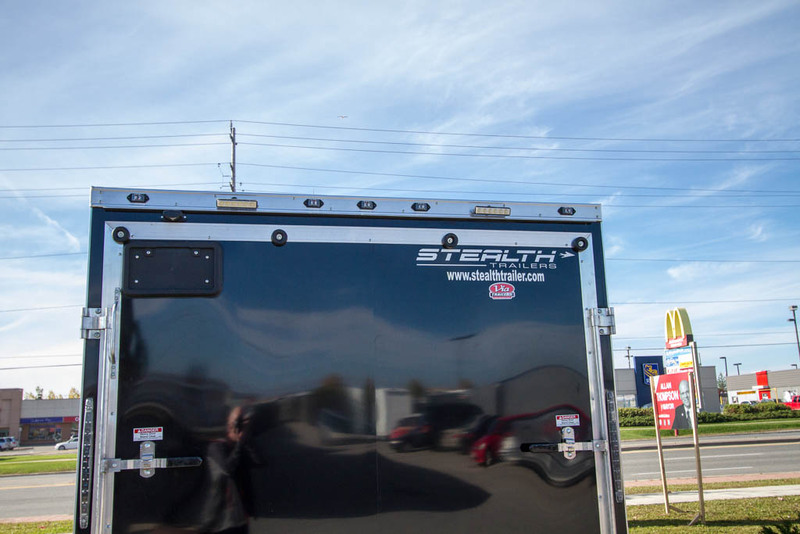 The trip was very beneficial: we were able to see several different trailer models, and we spoke at length with the rep from the dealership about different options. We were able to get inside several ‘working’ trailers (units designed for people to work out of) along with a few cargo models. The working models were a concession trailer (a food prep trailer for a fair or carnival) and a stage trailer. Just about every feature we were looking for was represented in some fashion among the models on the lot. We also saw options we didn’t know existed. …there are a few items added to the bottom of our list of wants and needs. Probably the easiest way to keep things straight is if I use our Spec Sheet and discuss our findings on each line item. 1. Dimensions Width 8 feet length 16 feet height 7 feet. After being inside a lot of them, the trailer that we think would most likely meet our needs (and the one the dealer will quote on) is a “14+2” trailer, 7’ wide, and 7’ tall. The “+2” represents the v-nose of the trailer. 14’ x 7’ is plenty of room for a few operators and equipment storage. The advantage of the V-nose is that you gain extra interior space without really increasing the trailer length. What was most interesting to discover about trailer size is that height is almost more valuable than width. A 6’ interior is not enough, and a 6’6” is pushing it. 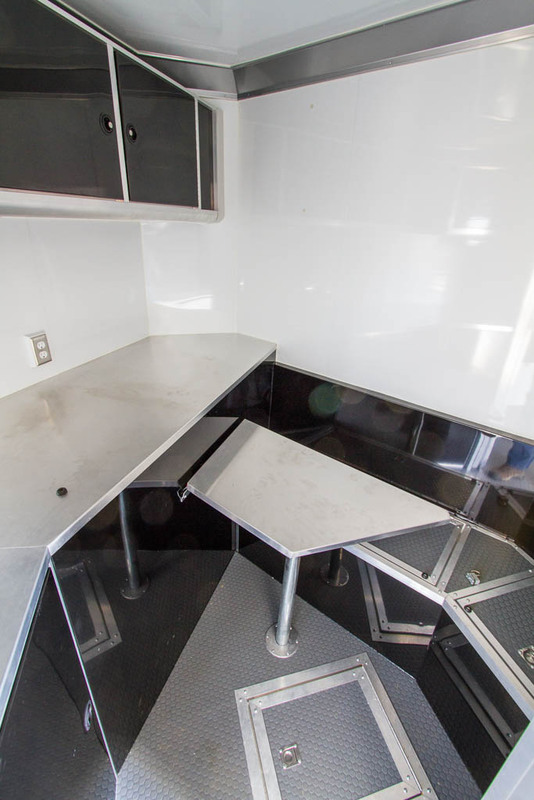 If we go with a 7’ tall trailer, we can add flooring and interior panelling (ceiling) plus whatever light fixtures we desire and we still have adequate head room inside. 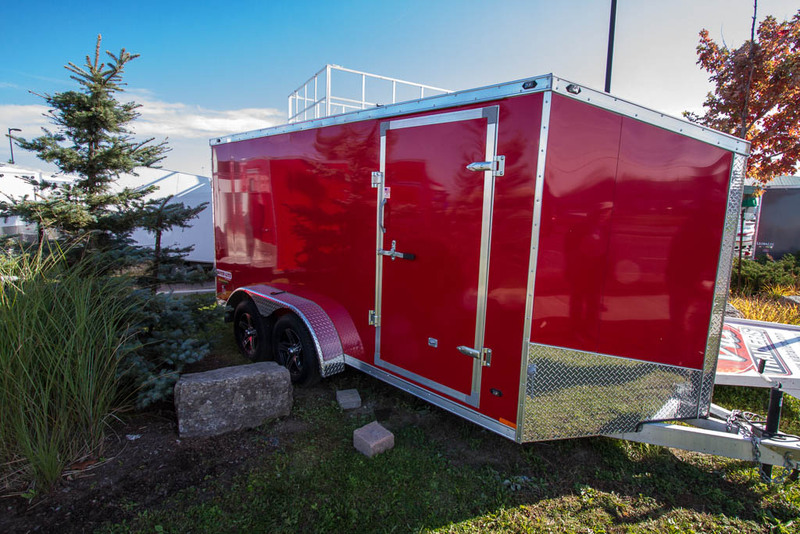 The general thinking is that a 7’ wide trailer balances our interior space needs with ease of towing and maneuverability. 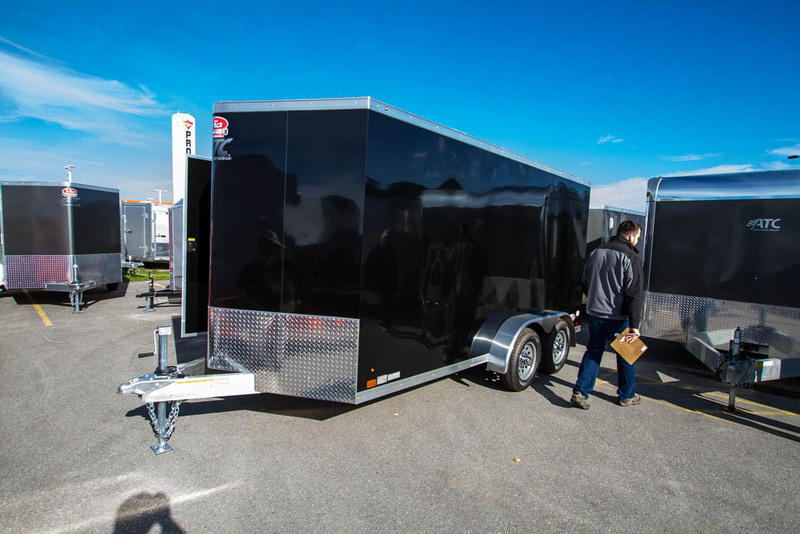 Wider trailers (they’re typically 8.5’ wide) require extended towing mirrors, weigh more, etc. Yes. Steel deteriorates pretty quickly. Aluminum adds ~$1500 to the price, saves 200-300 pounds weight, and looks much better after 10 years. Steel frames require a lot of prep (line-X or similar) and yearly maintenance, and they still rust quickly. A 14x7 aluminum frame trailer is about 1800 lbs empty. No. Not recommended by the dealer as they’re expensive to install and maintain. The solution to the electric/surge debate is a $500 wireless brake controller. There’s a trailer component (battery powered) and the vehicle side simply plugs into the cigarette lighter. Looks pretty slick. We asked for it to be included in our quote. Yes. Two rear barn doors are standard. Side doors up to 48” are available. I believe that the quote will reflect a 36” wide door, which will leave us with ~34” of usable width. 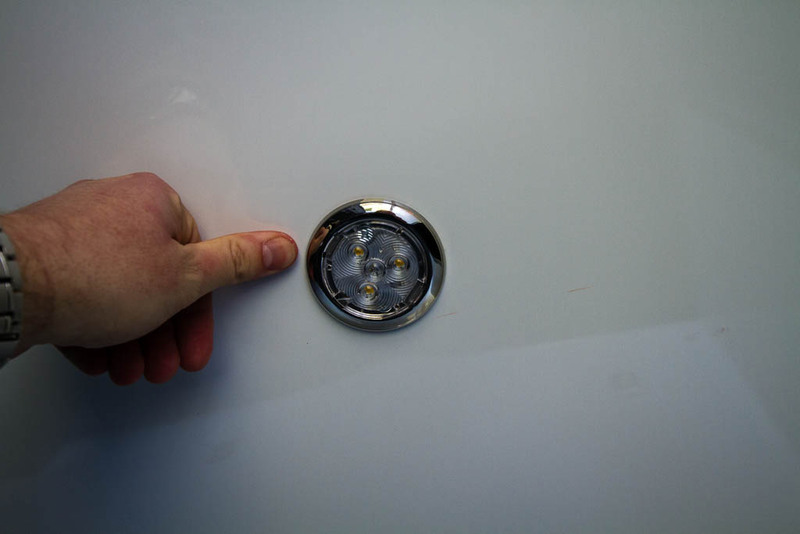 We should also spec out a grab-handle beside the door, and some type of RV-style light above or beside the door. 7. Roof racking with attached ladder – Roof strength for walking? You either get a walk-on roof or not. The walk-on roof means that they double-up the roof trusses from 24” spacing to 12” spacing, and install a sheet of plywood on top before covering it with aluminum skin. Roof/ladder racks are not a problem. Ladders are an easy option as they’re common. I think we could just put some of that grip-tape on top of the roof and we’d be fine. Yes. Multiple units if we want. Cheaper than air conditioning. Powered vents aren’t all that expensive. 9. Lighting internal 12 volt light fixtures 4? Standard is 12v fluorescent fixtures, although we can replace them with LEDs. Either factory, dealer or do it ourselves. Note that the recessed lights in the photos are from the ‘Cadilac’ of trailers, and aren’t an option on the more affordable Stealth brand. We’d end up with surface-mounted lights. No problem. We saw some slim LED lights that would work. 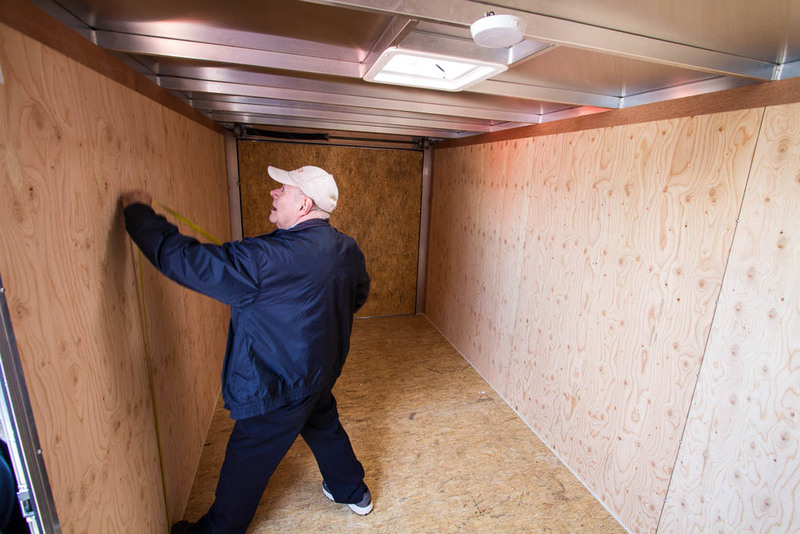 Further, with 12v lighting, there’s a power cable that runs around the inside of the trailer at the top, and is easy to locate and tap into. …meaning it wouldn’t be hard to add our own if we want. Easy. Dealer option or do it ourselves. Likely cheaper if we just do it ourselves. Yes – no problem. GFCI on the exterior. The dealer will quote us on a 30-amp panel, interior and exterior receptacles. It’s interesting to note that the trailers made in the US (as the examples we saw were) are built to U.S. electrical standards. They’re fine (legal) for plug-in use in Canada, meaning we can back up and plug into a building. They won’t pass an ESSA inspection though. For ‘Canadian’ electrical, we’d have to spend another $600. The ‘Canadian-ready’ option includes more grommets as wires pass through the frame, more grounding, etc. Apparently only applicable if we’re going to be hard-wired into a pole. If there’s a receptacle box at the base of the pole, and we plug in, we’re okay. Worth a little discussion, but at the end of the day, probably not required. Yes. 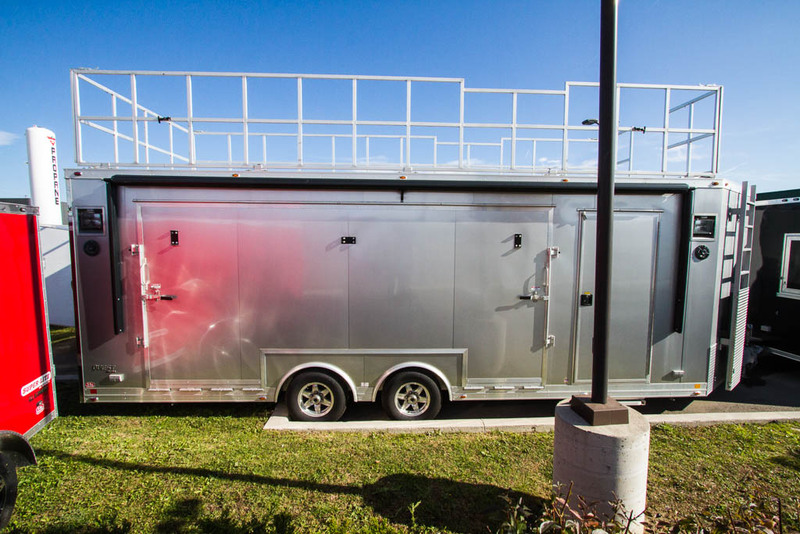 With a 7’ tall trailer, we don’t lose any door height when we add an awning. If we had a shorter trailer, they’d cut down on the door height so it wouldn’t cut the awning. Not really. 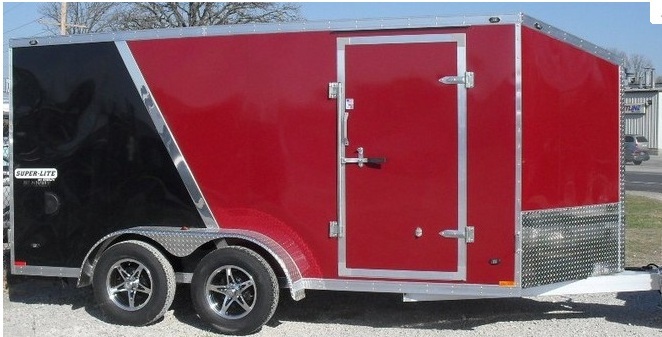 Aluminum framed trailers come from the factory with aluminum rims. The spare tire is steel. Yes. The 14+2 trailer has a sloped v-nose (not full height all the way forward, a little more aerodynamic). See photos. Possibly possible. Likely very expensive. Easier just to go without air conditioning, then we can run with a smaller generator that’s more portable. For example, a 2kW Honda would be fine if we didn’t need to power air conditioning. Worst case is we could simply get a wheel kit for a bigger generator and roll it down the ramp. Yes. There are a few options, but the simplest and dealer-recommended one is a foil bubble wrap. Doesn’t take up any extra interior space, and acts as a vapour barrier. Equivalent to R-6. Apparently the cut foam sheets can introduce moisture problems. In discussions, all we’re really looking for is something better than ‘zero insulation’, and the foil wrap with a light-coloured trailer should suffice. RV style windows are ~$200 each, and can be put where we want. 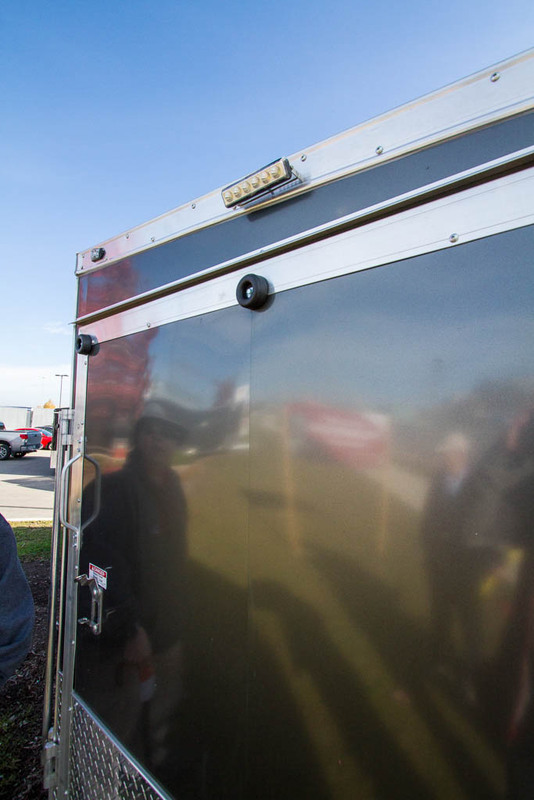 Note that the ‘take out windows’ in the pictures are on a concession trailer. Those windows are – if I remember right – somewhere north of $1500 EACH. At that price, the RV windows are fine. They slide open, and will push out in an emergency. If I had to decide on placement, I’d say right side toward the back, left side toward the front. Couple that with a door (RV doors are possible) and roof vents and we’d be fine. We think this means partitions. Something that we’ll do ourselves rather than pay the factory or dealer to install. We could also just use a heavy curtain if we wanted to section off the back of the trailer. Yes. The aluminum grip panels. 24” is standard. Custom modification. Generally thought to be a good idea by the guys that went down. As Drew points out, a rear ‘bumper’ can support the ramp, and allow us to close the door. If the ramp is supported by the trailer floor, the door needs to stay open. The dealer will check with the factory, if not we can have someone weld an aluminum tube on the back. Further, a rear bumper might save us from an expensive ding in the door. Yes, as many as we want. They’re about $12 each (probably plus labour). They go through the floor of the unit. Seems to solve a lot of problems, including water ingress. Side-wall access panels seemed to be unusual and a custom job, meaning a custom price. Cheaper and easier to use one of the floor cable pass-throughs. “Like a generator cable?”. Yes. The dealer may quote on an RV style twist-lock plug for us. 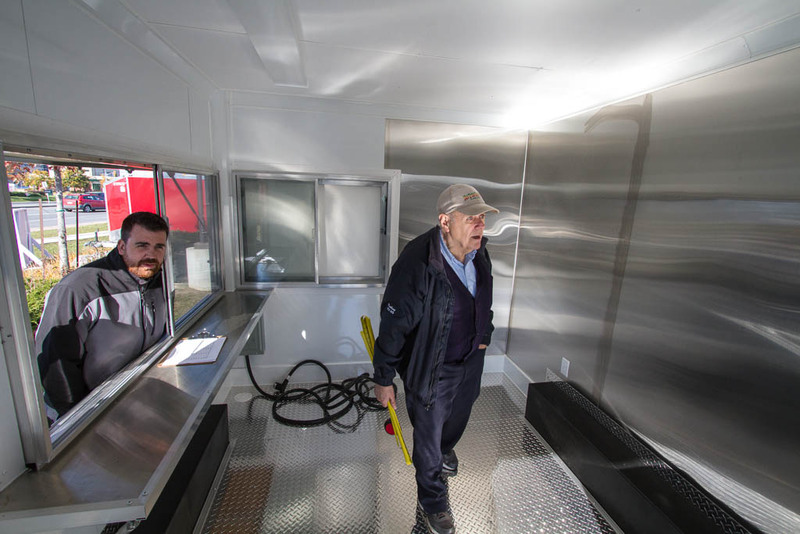 This means – I think – that we can either have a big cable that we pull out from the inside and run over to our generator (see the pictures – there’s one coiled up on the floor), and/or a receptacle on the side of the trailer much like an RV has. Grab bar to the left (opening side) of the side door. RV light above or to the left of the door. I like the amber bug lights. Flooring. We haven’t specified what type of floor we want. My vote is for rubber or vinyl that can be swept and mopped. If we don’t spec it, we may end up with wood. 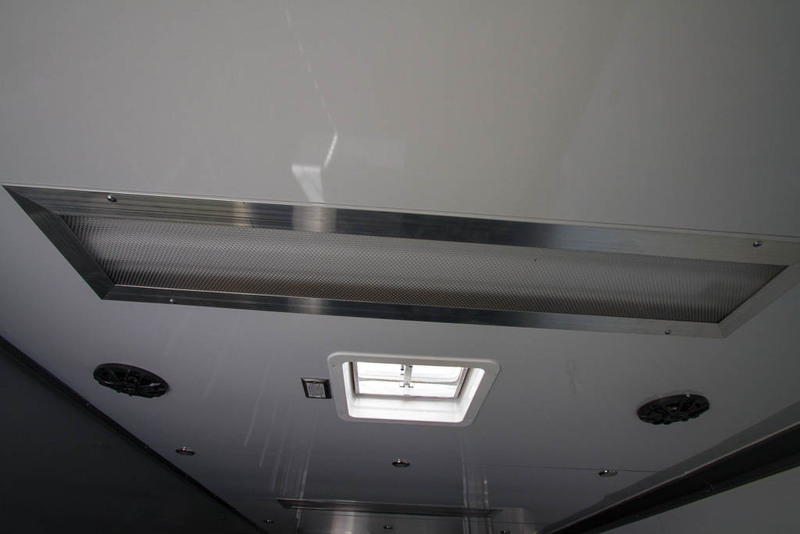 Interior paneling – can be either aluminum or some type of plastic/vinyl. We’d just have to pick one. Plywood vs OSB. The dealer talked about plywood this and that, but all of the trailers I saw had an OSB interior, not plywood. Sometimes this is a Chevy/Ford argument, sometimes not. We should decide what we want and spec it. If there’s sufficient glue in the OSB and we keep the water out, it should be okay. Stowable step for the side door. We saw some trailers with this feature. Retracts up underneath the frame. We’d lose ground clearance, and add cost. Something to think about.